When I was a sophomore in high school, I had very little understanding of what engineering was. I think I held a fairly stereotypical viewpoint of it: it was something that men did and it involved a lot of math. And what it precisely was that they did, I couldn’t say. It was not something I had considered at all up to that point when I considered potential future careers or what I wanted to study in college. It felt like every day I was bouncing from one idea to the next: doctor, architect, marine biologist. Then one day late in the year, my mom told me that she had signed me up for an event called Introduce a Girl to Engineering Day at Purdue University. I went in with no way of knowing the impact it would have on my future path. Over the course of the day, my eyes were opened to the seemingly endless possibilities of engineering majors and applications of an engineering degree. I also met groups of intelligent and friendly women who were studying engineering and I listened to their stories about how they made that decision. For the first time, I had some association between myself and the engineering field. I could relate to these women and I started to picture myself in their shoes. I began to fall in love with the idea. I had always enjoyed learning about calculus, chemistry, and biology, but I didn’t realize that I could apply these topics in so many different ways. I also didn’t realize engineering was as much about creativity and innovation as it was about hard science and math. I remember leaving the event and spending the whole two hour car ride home telling my parents about what I had learned. I then spent the next several months googling everything I could about different engineering fields. I ultimately landed on biomedical engineering, as it gave me a chance to explore the medical field in a way I hadn’t previously considered. I honestly haven’t looked back since then; I’m now entering my senior year at Florida Institute of Technology and the program has been a great fit for me and my interests. I’ve also really enjoyed learning about all the different applications of biomedical engineering in human spaceflight. That was one of the biggest lessons I’ve learned so far: you don’t have to sacrifice one passion for another. My love and interest in space could benefit my degree in biomedical engineering, even if the path wasn’t clear cut. 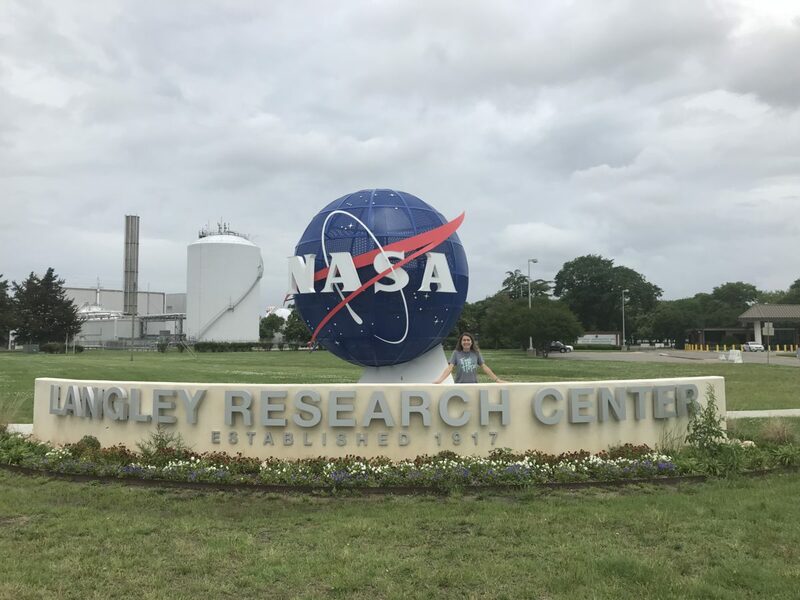 This summer, I’m working at NASA Langley on the Exploration Medical Capability project, enhancing a database of medical supplies, devices, and pharmaceuticals for potential use in long-term human spaceflight missions. There is something incredibly rewarding about finally applying classroom knowledge on real world projects that could have great impact in the future. I’m so thankful that I had learned about engineering when I did. It’s crazy to look back and see that I didn’t even know the field existed until halfway through high school! I most likely wouldn’t be where I am today if not for that one day many years ago. Now, I volunteer at my local Society of Women Engineers’ Introducing Girls to Engineering events and at local elementary schools in the hopes of impacting those girls in the same way I was. I love witnessing the curiosity and wonder that the girls all seem to share when they see videos of massive rockets taking off or hear stories about projects that the volunteers have worked on. I can’t wait to share what I’ve worked on this summer as a NASA intern at future events. Ultimately, I want to continue to help girls see that the world of STEM is much more expansive than they may think, and that it is open to anyone with passion and curiosity. Apply for NASA Internships by creating a profile at intern.nasa.gov!